Entry timing: Anytime during the day. Boats available from 8 am to 8 pm. Entrance fees: Free to enter. Boating charges: Rs.10/- (row boats), Rs.50/- (paddle boats), Rs.100/- (Shikara rides), for 30 mins. 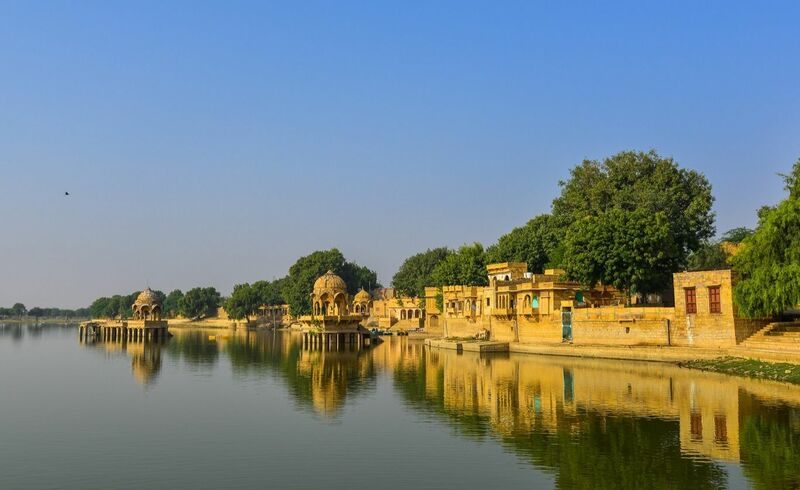 Gadsisar Lake was built as a water reservoir way back in the 14th century by the founding Rajput ruler of Jaisalmer, Rawal Jaisal, but today, it is not used as one. Today Gadsisar Lake is the most attractive tourist hotspot in Jaisalmer. The lake is named after Maharaja Gadsi Singh, who revamped the lake to make it more beautiful. There are temples, chhatris, shines, and ghats, all along the banks of the lake, making it look beautiful. The calm waters of the lake makes it perfect for boating and photographing wonderful scenic vistas and mind-blowing sunrise & sunset views. Birds can be seen wading on the waters, and flying in the azure skies above. There are catfish in the lake as well, whom you can feed. At the entrance of Gadsisar Lake is Tilon ki Pol. This magnificent arched gateway is made of yellow sandstone, and has intricately carved windows and chhatris. It also has a temple dedicated to Lord Krishna adjoining the pol. There are chhatris, ghats, and temples bordering Gadsisar Lake, which makes it perfect for scenic landscape photography. Boating is very relaxing thing to do in Gadsisar Lake. You can also feed the catfish in the waters of the lake. Birds can be seen wading on the waters. Migratory birds can also be seen flying over Gadsisar Lake in the winter season. Take your binoculars or a DSLR Camera with you. And di visit the Folklore Museum and Desert Cultural Center situated quite close to the lake. You will enjoy the puppet show in the museum, and various exhibits like coins, musical instruments, textiles, old utensils, rare manuscripts and other artifacts relating to folk history of Rajasthan. When to visit Gadsisar Lake? Avoid the scorching summers, and go in the winter season, in the months of October to March. The cloudless skies, sunny days, are perfect for boating in the lake. Also, this is the season, when migratory birds stop at Gadsisar Lake while on their way to Bharatpur Bird Sanctuary, which is close by. How to reach Gadsisar Lake from your hotel? Gadsisar Lake is just 2 km from the railway station, and close to Jaisalmer Fort. You can take tuk tuk auto rickshaw, or hire cabs from your hotel to Gadsisar Lake. Where to eat near Gadsisar Lake? Where to stay near Gadsisar Lake?